Clinical heterogeneity is a confound common to all of schizophrenia research. Deficit schizophrenia has been proposed as a homogeneous disease entity within the schizophrenia syndrome. The use of the Schedule for the Deficit Syndrome (SDS) has allowed the definition of a subgroup dominated by persistent and primary negative symptoms. While a number of studies have appeared over the years examining the electrophysiological correlates of the cluster of negative symptoms in schizophrenia, only a few studies have actually focused on the Deficit Syndrome (DS). 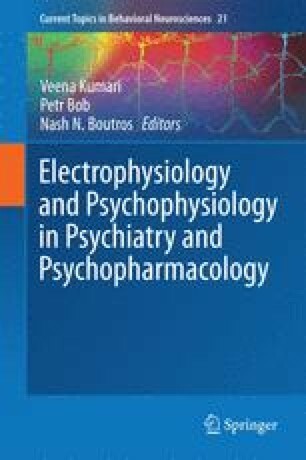 In this chapter, electrophysiological investigations utilizing EEG, Evoked Potentials (EPs), polysomnography (PSG), or magnetoencephalography (MEG) to probe “negative symptoms,” or “Deficit Syndrome” are reviewed. While this line of research is evidently in its infancy, two significant trends emerge. First, spectral EEG studies link increased slow wave activity during wakefulness to the prevalence of negative symptoms. Second, sleep studies point to an association between decrease in slow wave sleep and prevalence of negative symptoms. Several studies also indicate a relationship of negative symptoms with reduced alpha activity. A host of other abnormalities including sensory gating and P300 attenuation are less consistently reported. Three studies specifically addressed electrophysiology of the DS. Two of the three studies provided evidence suggesting that the DS may be a separate disease entity and not simply a severe form of schizophrenia. No support was received for the development of this chapter.